It was in 1854 that the Board of Trade gave to Vice-Admiral Robert Fitzroy RN, the task of founding and running the British Meteorological Department. Fitzroy was told to prepare tables of weather for different ocean areas, that mariners could refer to for the likely weather at that time of year. The Vice-Admiral, was a good choice for such as task, for he had been the captain of HMS Beagle when it circumnavigated the world, between 1831 and 1836, with Charles Darwin on board. He had proved himself a first rate navigator and surveyor on the voyage. In the eleven years running the new Meteorological Department, Fitzroy went further than his brief, by introducing the first daily weather forecast in the Times, to some public derision, when it didn't always prove itself so accurate as today. By having observers in coastal ports and resorts around the country, and using the telegraph to send in their measurements and observations every morning Fitzroy, and a team of three others, would have a forecast for the country ready by 11am. He also devised, in 1861, a storm warning system for shipping which resulted in harbour masters hoisting a pendant to indicate wind speed and direction. Robert Fitzroy also invented a barometer that was both cheap and accurate. Sadly, he was prone to mental depression and he took his own life in April 1865. After Fitzroys' death, the Meteorological Department grew and embarked on gathering weather data from all over the world. Innovations were introduced, such as the use of radio to transmit weather information to the shore from ships in the Atlantic, in 1909. The development of flying required accurate weather forecasts and in 1912, the Department established a weather station at South Farnborough to provide up to date weather forecasts for pilots. On 14th November 1922, the BBC broadcast its first wireless weather forecast provided by the Met Office, followed in March 1923 by a daily broadcast. The importance of accurate weather forecasting in war became apparent when the D-Day landings were postponed for a day, on the advice of the forecasters. The German forecasters failed to see the small high pressure system that allowed the invasion to go ahead on the 6th June. The 1953 flooding of eastern England prompted the Met Office to introduce a Storm Tide Forecasting Service, followed on 11th January 1954 by the first regular BBC television weather broadcast given by a trained meteorologist. A purpose built weather centre was opened by the Queen in Bracknell during 1962 with its first electronic computer to provide forecasts using newly developed numerical techniques. Over the years, at Bracknell, the Met Office introduced the first satellite weather pictures, the first super computer and embarked with others on international collaboration in weather forecasting. In 2000, the staff of the Met Office were balloted about the destination for a move - the other possible towns were Norwich, Reading and Bracknell. Exeter proved the favourite, and after other considerations were taken into account and complex negotiations with the City Council, the Government announced in November 2000 that Exeter would be the destination for the Met Office building. Work started on 1st November 2001 to build a state of the art, weather forecasting centre with Broadway Malyan chosen to design the new building. A consortium of Costain, Skanska and Group 4 Falk were contracted to build and run the new building for 15 years, at a cost of £150 million. Two supercomputer halls were built, an energy centre, a library and visitor/conference facilities. The first computer hall was handed over in December 2002 and the installation of computer systems started in January 2003. 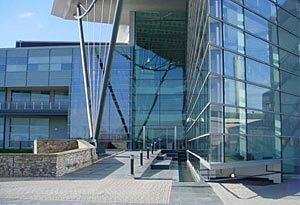 The first staff from Bracknell moved into the building during June 2003 before the new Met Office was formally opened on 18th December 2003. This was an exciting time for Exeter with 1,150 staff along with their families moving down to the area, and scores of new jobs for locals created to service the centre. The Met Office building is a modern, energy efficient centre that provides weather forecasting services to governments, military, international companies, airlines and many other organisations. It is designed with a single street layout, with offices branching off and a central stream running through the building which helps staff to orientate themselves and offers some security. Much of the work in the building is covered by the official secrets act and the Met Office is attached to the MOD. It is fittingly located down Fitzroy Road, in the east of the city. History starts yesterday, and the Met Office moving to Exeter is an event that will be etched into Exonian's memories for a long time and will hopefully prove to be a worthy addition to Exeter's history.